StockMarketEye portfolios can include holdings for which quotes are not available. These type of holdings are referred to as non-quoted items and do not have live quotes or historical quotes available for automatic download from any of the data providers supported by StockMarketEye. StockMarketEye provides for manually importing historical prices from a CSV file for any symbol. This feature is typically used to support non-quoted items. However it can also be used to replace automatically downloaded historical quotes when those quotes are known to be faulty. 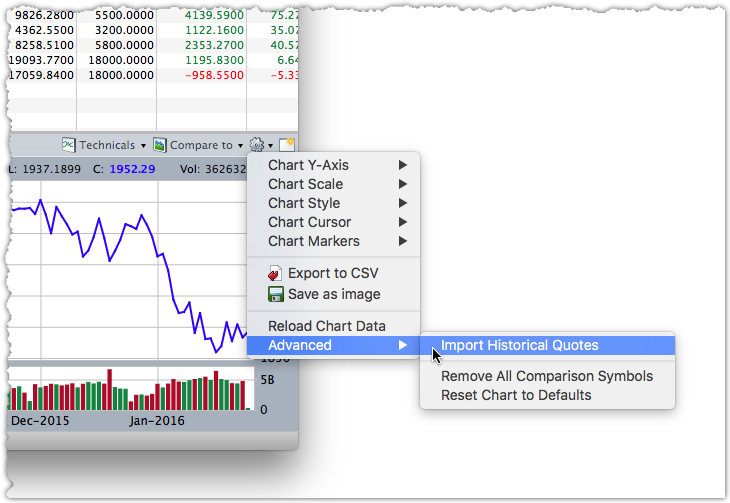 Open the “Chart Options” menu, then click on Advanced -> Import Historical Quotes. This will open the “Import Historical Quote Data” window. Click on the “Browse” button and select the CSV file containing the historical quotes to import. Ticker Symbol - The symbol of the security to which the quote data belongs. Date - The date of the historical quote. Open - The opening price on the date. High - The high price on the date. Low - The low price on the date. Close - The closing price on the date. Volume - The trading volume on the date. Ticker Symbol - The ticker symbol of the security to which the quote data belongs. Volume (optional) - The trading volume on the date. The open, high and low values for the date will be set to the same value as the open value. Replace the historical quotes with the quotes from the file. In this mode, the current historical data in StockMarketEye, for any symbol found in the imported CSV file, will be deleted before the import starts. The historical data from the import file will then be imported to replace the data that was just deleted. Add the historical quotes from the import file. 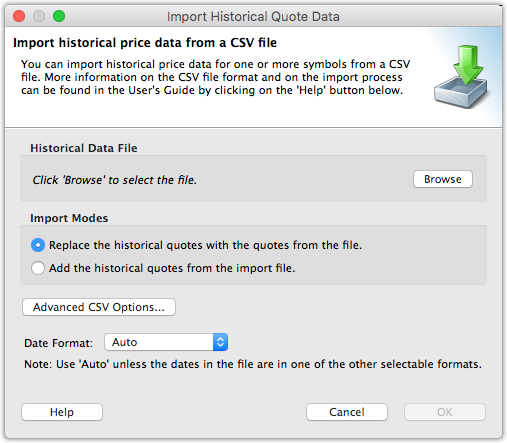 In this mode, historical quotes from the imported CSV file are only imported into StockMarketEye if they do not already exist in StockMarketEye’s historical data. Existing historical quotes are not overwritten and duplicate quotes for a date will not be saved. More precisely, if the imported symbol and date match an existing symbol and date in StockMarketEye’s historical quote data, the imported data for that date will be discarded and not used. Once you have chosen the CSV file and the import mode, click on the OK button to start the import. When the import is finished, StockMarketEye will display an informational window with details about what was imported and the chart will be reloaded. If the symbol, for which you imported the historical quotes, is not currently shown in the chart, click on it now to see its chart. Manually imported historical data is saved in the StockMarketEye backup files. Manually imported historical data is currently not synchronized across devices with our on-line synchronization service. We may offer this feature in the future, however. If you are interested in this feature, please let our support team know.